Lovely simple design twin wall light, with a polished chrome wall mount, two curved upright arms and heavy acid etched glass shades with clear cut detail. Class 2 double insulated, no earth required and supplied with dimmable halogen lamps. 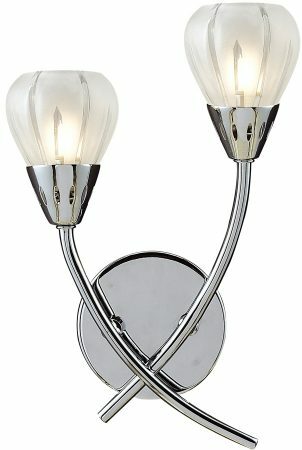 Other fittings in the polished chrome Villa range can be viewed below and include a four-light flush ceiling fitting.